It happened a few days back (Jan 28), but only today does the news of a massive oil spill on the Indian coasts trickle down to my eyes through conventional news channels. A cleanup effort ensued, which has taken care of the most of it. It is good to see volunteers in action - would've liked be one meself. So it happened off the Kamarajhar Port (Ennore coast), off the coast of Chennai, in Tamil Nadu the southernmost Indian state (title shared with Kerala state). A massive clean-up operation was launched in Tiruvallur, Chennai and Kancheepuram Districts by engaging more than 2000 persons at various sites including Ernavur, Chennai Fishing Harbour, Marine Beach, Besant Nagar, Kottivakkam, Palavakkam, Neelankarai and Injambakkam beaches. Merchant shipping fail, this. The spillage exceeds 200 tonnes, and has been under-reported to be around 20 tonnes.The general mode of our business is evasive/thrifty/lying. Being honest is the least they could do in this case. A proportional (legally instituted) fine is the most nominal punishment, for we do not realize to what extent of damage such events have on the nature. There is no way or no amount of money that can thwart the ecological cascade that might ensue. Just a day back, we celebrated the World Wetlands Day 2017 , which wasn't really celebrated anywhere but had a few articles written about it. No representation among the masses for valuable, massive ecological zones providing our communities with sustenance - by the way of fresh water, food, flood control - for generations - called Ramsar sites - under threat because of (who but) us. For those who don’t know what a wetland is, it is a land area that is saturated with water, either permanently or seasonally, such that it takes on the characteristics of a distinct ecosystem. They are also very important for animals and plants to survive. Actually, they are one of the most vital and productive ecosystems on the planet. Unfortunately, this valuable asset of the planet are slowly getting lost at an alarming rate in many regions of the Earth. According to a report, at least 64 per cent of wetlands have diminished since 1990. In the month of November, I found myself very lucky to be in Begusarai for some survey work. Lucky, because Begusarai district was home to the Kanwar Bird Lake Sanctuary, housing Asia's largest oxbow lake - 3 times that of Bharatpur, where I had already been to and returned impressed at its immensity. Super eager, I asked around for directions, to come to know that it was only a small lake, and nothing much was to be enjoyed there. Being a skeptic about other's perceptions (esp when it comes to natural wealth), I looked it up online, to find that the place really was now an unimpressive waterhole, far from what it once was. In the present study the pollution of a major North Bihar lake, the Kawar Wetland was studied with special reference to their effects on flora, fauna and local human population. The water of the lake is turbid, acidic and is having higher conductivity. The dissolved oxygen level was estimated as 7.6 mg/L, free CO2 6.3 mg/L, bicarbonate 80 mg/L, hardness 90 mg/L, chloride 17.0 mg/L. A coupla years back, in the February of 2015, I had suffered a similar setback on a morning, when after adventurously breaking a journey (a roadtrip in a Tata Sumo with a friend) next to a huge lake, imagining creatures and phenomenon unseen, we woke up to find that the massive lake was now an empty trough, all its water drained for construction projects (esp a massive college complex in vicinity) - I best enjoyed that morning exploring a graveyard next to the lake that separated it from a village, a symbolic image to take back in my state of shock and mourning. This was near Hyderabad, in the state of Andhra Pradesh. Population pressures on the Indian ecosystem are colossal. Things are already depressing, and we make no efforts to change. Bangalore and Chennai are prime examples of destruction of wetlands, to the extent that they (the related wetland ecosystems) have disappeared. Corruption - by the way of bribes and complacency - is rampant everywhere. In this state of affairs, the nature is no way on the track of winning. 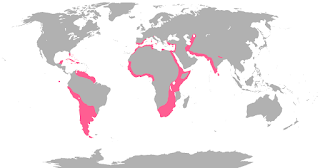 This is the range of flamingos across our planet. See that strip on the left - that's the Indian subcontinent. The bird is supposed to exist everywhere along our western coastline in the migratory season. Yet, now it is only left with a few spots to camp at, namely in the state of Gujarat (like the RoK). This morning, I was surprised to find Mumbai on the map as well through a cousin, learning the existence of Sewri Flamingo Point, which I would've been to had I known during my stay there. Now I wait for an opportunity.